The Curious Nanny | There's always something new to learn! I always try to teach my kiddos a love for reading. It doesn’t matter to me what they’re reading. If they are sitting down with their eyes glued to a book, magazine, comic book, or whatever, my day is made. My heart is warmed. Reading was a big part of my childhood. The 7 year old I work with loves reading, but I’ve been finding it challenging to find books that will hold his interest enough to motivate him to pick up the book on his own. Last summer, we read Matilda (by Roald Dahl) together, alternating chapters, and he loved it. He also read aloud really fluently, so I knew his reading level was pretty high. About a month ago, I introduced him to “The Indian in the Cupboard” by Lynne Reid Banks. To “bait” him, I read the first chapter aloud to him. He put the book down for a bit, then after about a week, he picked it back up and couldn’t put it back down! He’ll be on vacation this coming week, so last week he hurried to finish the book so that I’d have time to get the next book, “Return of the Indian,” from the library to take with him. 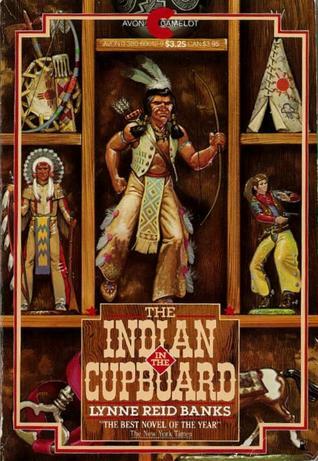 “Indian in the Cupboard” has a reading level of 5.9, and he’s in 2nd grade. Now I have a better idea of what reading level I can look at for future books for him. Want to get your early reading loving to read too? Here are some quick tips and tricks! 1) Don’t worry about what he/she is reading. There’s no such thing as “wasteful reading”. Go to the library and find a variety of types of books- picture books, chapter books, comic books, magazines, non-fiction, Ripley’s Believe or Not, etc. Then ask your kiddo what he/she enjoyed the most! 2) If you suspect that your child is intimidated by harder books, try chapter books with audio books! Following along with the words while someone else is reading them can be really beneficial when you’re helping a kid to improve their vocabulary and push them into a slightly higher reading level without any fear of failure. Just remember- if your child’s at a 1st grade reading level, look for something just a little higher, like 1.5 or 2. If there’s too many words that he/she can’t recognize, they’ll end up lost in the book and just listening. Listening isn’t horrible on its own- they’re still enjoying stories and using their imagination and listening skills, but the most benefit comes from seeing and hearing the words together. 3) Read together to get a better idea about what their reading strengths and weaknesses are. You read a page, they read a page is a good start, and alternating chapters can be good for stronger readers. This can be a fun experience for both of you, and highly beneficial. You get to see how well he reads, what his comprehension is like when he reads, and how he flows as a reader, and he gets to take a break and enjoy listening sometimes, which makes the book less intimidating. Bonus! You can model voice changes, pace changes, and expression- all the things that take a good story to a great one! 4) Peak your kid’s interest in a book by reading the first few pages or the first chapter of the book to him/her. Or you can talk about how much you enjoyed the book as a kid and give a brief, exciting synopsis of the book. You can also try reading positive reviews of the book. 5) Never “require” that any specific book be read. It’s ok to set aside 30 minutes a day as “quiet reading time” (less time for younger readers or readers who just can’t focus that long or don’t enjoy it), but don’t put any requirements on what is read. If he/she wants to read the instruction manual for the new toy they got, go with it! Seeing reading books as a chore will quickly snuff out their interest in them. Spring has sprung and Easter is almost here! 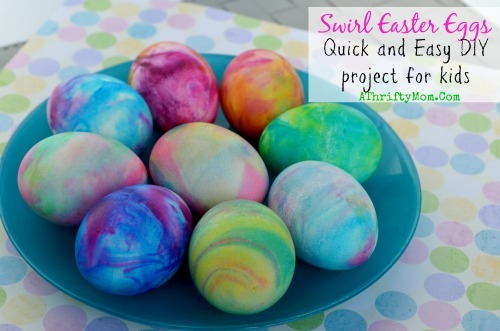 A lot of these crafts can be doubled as “Spring” crafts, for those of you who don’t celebrate Easter. Enjoy! 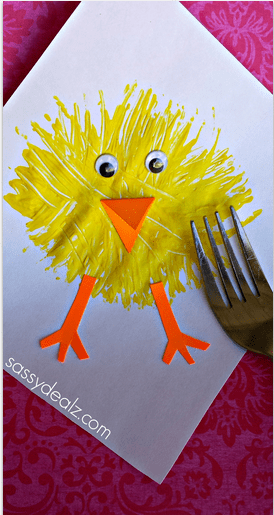 I have a few more on my holiday/seasonal pinterest board, including vibrant coffee filter flowers, egg sun catchers using contact paper, egg paper strip art, painting with plastic easter eggs, and LOTS of fun eyes for dying/coloring your easter eggs! It’s been a little while since I last blogged- whoops. Time just seems to fly away from me sometimes, especially since I like to pack my days full! I always joke that I’m allergic to boredom. It’s not that I don’t know how to relax, it’s just that life seems so much better when I feel like I’m doing a lot with it, you know? Spring is finally here! I have been soooo happy to be able to take my kiddos outside to run around in the grass and play in the sunshine. Pretty soon it’ll be warm enough for picnics at parks with friends! Oh! And isn’t Easter coming up soon? I tend to forget, since I’m working with a Jewish family. I guess it’s time to pull out some Easter crafts! I’ll do that soon. I started a new book: Will My Kid Grow Out of It? by Bonny J. Forrest. It’s a super interesting overview of some typical childhood issues that can help you determine what kind of help your child might benefit from. I’ve always been fascinated by children’s minds. I haven’t finished the book yet, but it’s been easy to read and incredibly insightful. Amy’s Fancy Bistro has continued to be a big success! There have been hits and misses, but the kiddos have enjoyed each week and have tried everything I’ve put in front of them. Last week, I made tilapia fillets baked with a lemon-honey-soy sauce brushed over the top. Both kids LOVED it, and my pickiest eater has already been asking when we can have tilapia for dinner again! The younger one is apparently a fan of salami now! One of their favorite nights was when I had a “Japanese” theme and made three kinds of faux sushi. I flattened slices of bread (with the crust cut off), put different things on the bread, then rolled it and sliced it into little “sushi” rolls. The fillings that night were peanut butter and banana, pumpkin/ cream cheese spread with apple, and cream cheese with grated carrot. I served it with edamame and let them eat using chop sticks (in any way they wanted). I also put on the “Yoshida Brothers” station on Pandora for some asian flare, which they also enjoyed. That’s all for now! 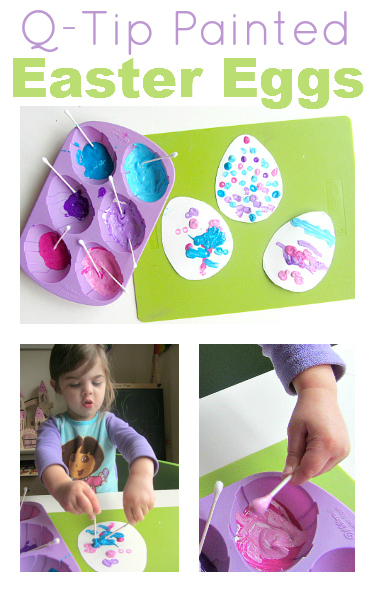 Easter crafts will be next! I work with some picky eaters who are incredibly reluctant to try new things. Even more difficult, I have a picky eater who doesn’t like to try new things but also doesn’t like to have the same things too often or he gets burnt out and doesn’t like them at all anymore. It’s a tough situation that I’ve been struggling with for years. I have gotten him to try new things and have definitely expanded his “Things I’ll Eat” list. But there’s still a lot of room for things to improve. I decided to open up my own restaurant! It’s called “Amy’s Fancy Bistro”. It’s not real, of course, but I tried to make it feel as real as I could. I went to Target and got plastic plates, bowls, and cups that look like they’re fancy porcelain and crystal. I didn’t want them to worry about the dishes accidentally breaking. I put on pretty piano music (Thanks Pandora!) I dimmed the chandelier in the formal dining room and lit a vanilla-scented candle. I put their plates on nice placemats and folded their napkins neatly with their forks on top. And when I put their food on the plates, I made sure it was presented as prettily as I could make it, like an expensive restaurant would. For dinner, Chef Amy served Crispy Chicken Bites (chicken breast cut into small chunks, rolled in olive oil and then breadcrumbs, and baked at 400 degrees for about 10 minutes or until cooked through and slightly browned), Roasted Squash Noodles (spaghetti squash), lightly buttered and topped with grated Parmesan cheese, and Freshly Diced Strawberries, dusted with powdered sugar and a small star of Whipped Topping (from an aerosol can- don’t judge, it’s all there was in the house). The beverage of the night was chocolate milk. The kids were asked to call me Chef Amy, and I gave them some simple etiquette. Food shouldn’t be eaten with fingers unless the Chef says it’s ok to. If you like the food, please compliment the chef! If you don’t care for something, the chef would appreciate some feedback about could be better, but be careful not to insult the chef. And the last rule- Enjoy your meal and let your server (me) know if there’s anything you need. They LOVED the whole thing. There was no arguing or pestering each other, no whining, no bad manners, and best of all, they tried everything on their plate without being asked! Neither of them liked the squash, which was the one brand new item on their plates, but I didn’t have to fight them to give it a try, and they gave me feedback about what they didn’t enjoy about it (it seems to mostly be the texture of it). And I got more compliments on the other things than I ever have at dinner before! It was a win-win for all of us, and they can’t wait to do it again next week! I’m hoping that Mr. 7 can give me ideas for recipes to try from the cookbooks I got at the library. And if he doesn’t, I’ll come up with something interesting and delicious! So all in all, the experiment was a huge success! Handprint/Footprint “Love” picture– There are so many ways to do this! 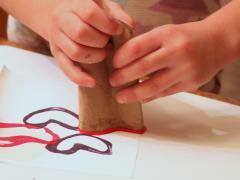 You can make it simpler by just making a double handprint or double footprint heart. And if you have a wiggly infant/toddler who won’t let you get the prints in the right place, let them enjoy the paint and put nice prints wherever, then cut and paste them into the shape you’re going for. Don’t let art get frustrating! Marble Art Valentines – I couldn’t find a picture illustrating this idea completely, but marble art is fun! How to make it kind of cool and amazing too? 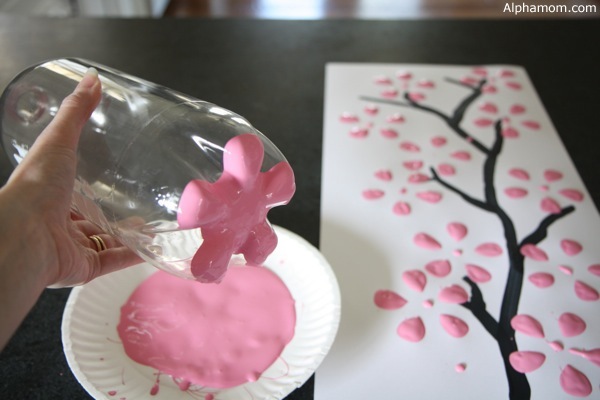 Before your kiddo does the marble art, cut out one or more hearts out of contact paper, and stick those hearts onto the paper the paint will go on. Make sure the paper gets very well covered with paint, and when it dries, peel off the contact paper and reveal the hearts! You don’t have to do this with marble art, though. You can just do some free form painting on the contact papered heart paper instead! 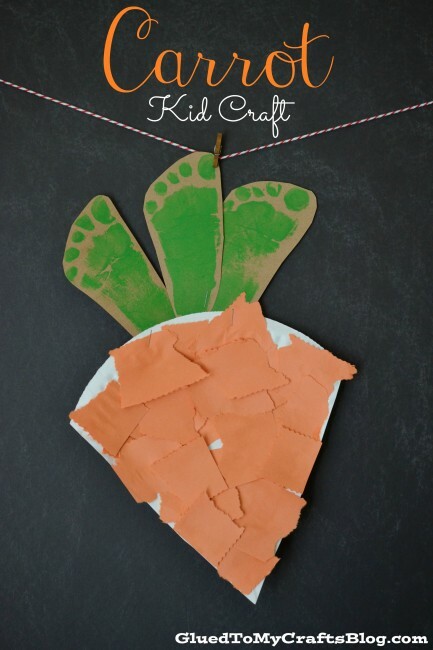 Both of the above projects would be fun for preschoolers, but here’s more ideas! Paper Roll Heart Stamps Fun and cute! Animals made out of Hearts– Because really, who can ask for more? Miss 4 loved making the cats last year when she was Miss 3, but there are so many choices! The heart shaped animals are still super fun for older kids, and BONUS- most of them can cut out their own hearts with or without a little help! But that doesn’t mean I’m not giving you more stuffs. 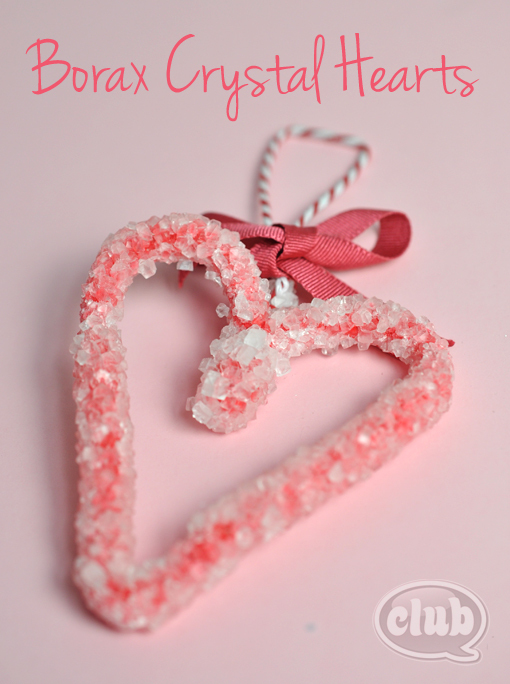 Heart-Shaped Borax Crystals– Craft + Science = Double Awesome. 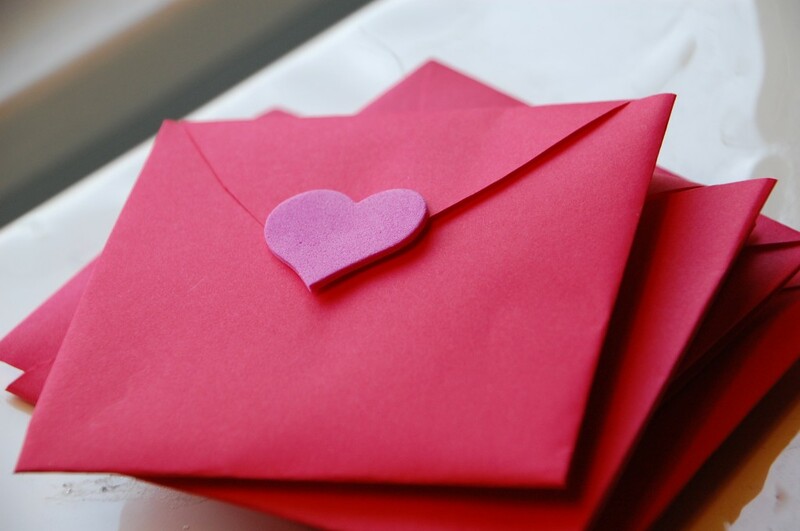 All-in-One Valentine Card– For more instant gratification, there’s this project, which can also work well for younger kids. The tutorial shows how to fold a heart into a cute envelope, so you can write/draw secret stuffs and then deliver it in an adorable way. I have so many other great ideas on my Holiday/Seasonal Pinterest Board! So if you’re not fulfilled yet, go check that out! Happy Valentine’s Day, everyone! Miss 4 is a very curious kid. I LOVE that about her. I’m the same way! I want to know everything about everything! I always ask her what kind of books she wants me to get for her at the library (I go while she’s in school), and there’s always something non-fiction on her list. She has asked for books about plants, gardens, skin, gorillas, seals, cats, tons of other animals, how the inside of our body works, how snow is made, our skin… the list goes on and on! I’ve become quite familiar with the non-fiction section of our local library. And my new favorite non-fiction children’s book author (and she illustrates, too!) is Gail Gibbons! There’s probably some of you out there who already love this lady, but I’m only just starting to get to know her. Last week, when Miss 4 wanted a book on how snow is made, I wondered if I’d be able to find one that was age-appropriate. 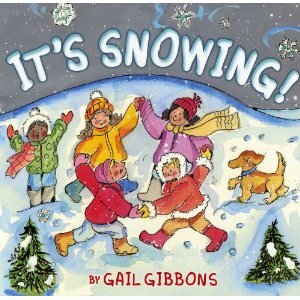 Gail Gibbons delivered with “It’s Snowing!”. It has lovely, fun illustrations and great, basic information. Some of it might go right over a 4 year old’s head, but that’s ok. You can discuss it further, or just focus on the more basic concepts. I loved that there’s a main story line, plus additional captions that you can read and discuss if you have time. Miss 4 loved it! 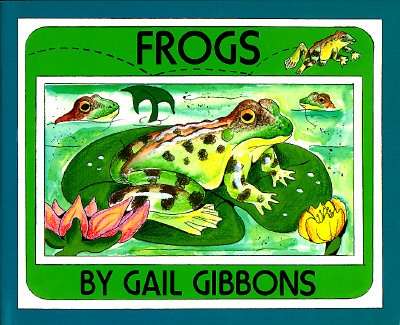 Today during our 30 minute drive home from Gymnastics, I handed Miss 4 Gail Gibbons’ “Frogs”- a book with a CD. I had to keep pausing the CD because she had more questions about things in the books, or just wanted to discuss something she found interesting (“Amy, there’s a frog that eats 100 mosquitoes in one night! Don’t you love that frog?” Yes. Yes I do.). By the end, she was saying how much she loved frogs, even though she hadn’t really thought much about them before. It was wonderful. The narration with page turns took about 20 minutes to get through, which is a little longer than what she usually listens to, but she didn’t lose interest at all. I can’t wait to discover all her other books! And there are a LOT. Check out her website to discover them all and learn more about this great author and illustrator! I’ll be posting Valentine’s Day Craft ideas next, so stay tuned! It a new year, and you know what that means, right? It’s time to reflect on the past year and decide what we can do this year to be a better person. Since you’re reading this, I’m going to assume you hope to continue to become a better caregiver. I know I do. It’s a constant journey, you know? So I’m here to help you out. There are some wonderful child care books out there, but there’s so many, I know it can be daunting to decide which ones to read. Here are some of my favorites. I’ve read each of these and have loved them. Hopefully you’ll get just as much out of them! I literally re-read this book once a year, sometimes more often. The strategies are simple, but oh so helpful, especially with kids that are school-age. Another one to read more than once! Everyone who cares for siblings should read this one. The title of this book is deceptive. You don’t have to have a baby to find this beneficial. It’s all about early childhood development, based on science and psychology, but written so that it’s easy to understand. I’ve written a few blog entries already about topics from this book. Definitely worth a read. This is more of a memoir than an advice/idea type book, but I think it’s an important book to read. If you’ve read much of my blog, you may have noticed that gender roles are a hot-button topic for me. I think it’s beyond important to allow a child to enjoy whatever it is that he/she enjoys, and not put gender labels on those things. Lori’s book is fantastic and heart-warming. You’ll love it. I promise. Great recipes and great advice on helping picky eaters to branch out- this is a well-organized, super helpful book! I already have some books on my 2015 reading list! Here’s the ones that I haven’t read yet, but plan to! Do you have any child care related books that I should add to my list? Let me know!